One of my favorite vegetables to cook with is Eggplant. It's slightly sweet and pairs well with the spice mixtures (or masalas) we cook with. In addition, there are so many varieties to choose from and can make dishes: small round ones, Chinese eggplants that are long and slender; both purple and white, Italian Eggplants, fat eggplants that I use to make bharta, etc. 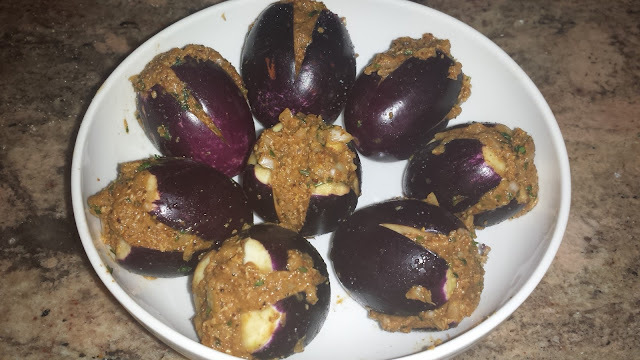 Last week we went to our local Indian grocer and we found these lovely small round eggplants perfect for making Guthi Vankaya. 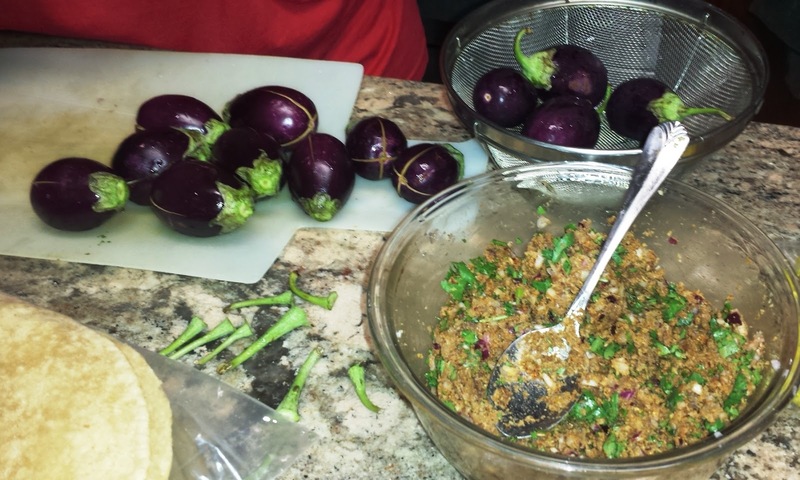 Guthi Vankaya in English means stuffed eggplant. This dish is popular in Andhra Pradesh. 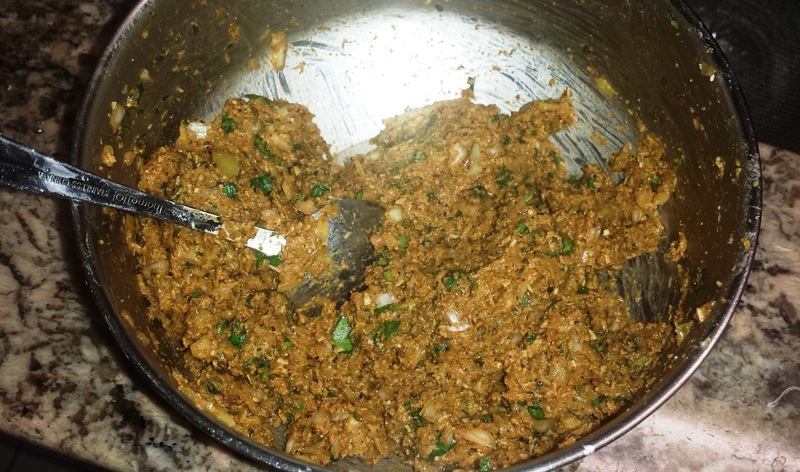 The stuffing is made with a variety of spices, onion and fresh coriander. Most of our family likes this dish, the only person who doesn't like it is my sister. She truly, deeply dislikes EGGPLANT. We trick her now and then by camouflaging the vegetable but she can see right through us. She's totally missing out. I mean who doesn't like Eggplant? I asked my sister many times but all she tells me is "I don't like the taste of it". Since my mother is making this dish for all of us, she throws in a potato so my sister can still appreciate the dish without eating the eggplant. The masala and vegetables combination is really delicious. It's not difficult to make; you just have to make the stuffing and stuff the eggplant and cook it together with the potato to the right consistency. Let's check out more details on how to make it. Cut the stalks of each eggplant and make a + slit at the bottom (as shown in picture below). Mix in a bowl all the dry ingredients: chutney powder, dhan-jeera powder, dry coconut powder, chili powder, onion, fresh coriander, and tamarind paste. Then sprinkle two tablespoons of water to bring the mixture together. Now it's time to stuff the eggplants. Rub a pinch of salt inside each of the slit eggplant. And then take about tablespoon of the mixture and stuff each of the eggplant and keep aside. Heat oil in a skillet on low-medium flame; then add turmeric. Stir and immediately add the stuffed eggplant and potato and sprinkle a couple of pinches of salt. Mix well and cook under closed lid for 3 to 5 minutes. 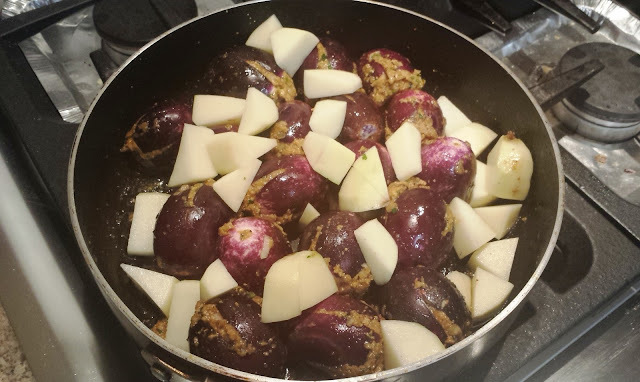 Add in remaining onion and masala mixture (if any) and stir and continue to cook for another 3 to 4 minutes or until the eggplant are browned. Transfer into a serving dish and garnish with freshly chopped coriander. Serve hot with rotis or rice. If you liked this recipe, also check out our Stuffed Karela dish. For more dish ideas, also check out our recipes page. Comfort Food Series: Waffles to the Rescue!